Fayston, Vermont. Thank you for following along with our adventures in the Green Mountains of Vermont. To celebrate our second year of wagmorevt, here’s a video slideshow of some of the best of last year’s photos. Enjoy! For daily photos, please follow me on Instagram @skimor, or search #wagmorevt. If you have a comment to share or would like your dog to be featured (if you’re within 50 miles of the Mad River Valley in Vermont, I’ll come to you), please fill out the contact form, below. They are always happy to see you. Even if you’ve only been gone two minutes, they are there, wagging. They greet you with a kiss. Many wet, sloppy kisses. 2. They want to be with you. Even if the bank didn’t give out treats, they want to go for a ride with you. Also, they want to make sure you are o.k. when you go to the bathroom. 3. They protect you by sounding the bark alarm. Squirrels and other rodents who wander too close receive a thorough scolding. Sometimes they even alert you when it’s windy outside. 4. They make sure you get some exercise. Every day. They remind you when it’s time to take a walk, and become really, really excited when you put on your BIG boots. 5. They make sure you take time for play. They interrupt computer time by bringing a ball. They grab a stick from the woodpile and make you chase them to take it away. 7. They keep you close. They use you for a pillow. The larger the dog, the more lap they need. Even if you’re not all that big. If you leave the house, they hop the doggy gate to sleep on your bed. On your pillow, so you can share dreams. They leave traces of their love on all your clothing, especially your favorite black sweater – it’s their favorite, too! I hope you celebrate your dog’s love by making sure you take a nice, long walk and spend time with them. Every day. That’s all they want. Well, some cookies would be nice, too. P.s. Be sure to follow me on Instagram @skimor for daily photo posts! I’d love to hear from you! If you want to leave me a love note;), or have any comments or questions, please use the form, below. Fayston, Vermont. Linus can’t catch. He becomes so excited at the thought that food is coming his way that he misses the toss. Every time. Unless he’s lucky. His consistency in missing is remarkable. On New Year’s Eve, we took a short romp in the woods after I came home from a day of teaching skiing. Once inside, I rewarded each dog with a small dog cookie. Linus missed the tossed treat, as usual. The treat bounced off his nose, sailed through the air then slid across the floor coming to rest underneath the refrigerator. Linus excitedly tried to pry it loose as I watched, amused. Then I thought, what if Linus becomes stuck, too? Dr. Roy would have another story to tell, but I’m sure I won’t like the bill. I reached into the cookie jar and pushed another cookie across the floor for Linus, which he hurriedly tracked down and gobbled up. Meanwhile, Charlie Brown took Linus’ place at the refrigerator, trying to dislodge the cookie. After a few futile seconds, Charlie stopped. He sat down and looked up at me. “Can you help, please,” said his large thought bubble. I knelt down, removed the stuck treat, and handed it to Charlie. Lucy stood by me, watching. Lucy is my star fielder. She catches everything tossed her way. Lucy is just as thrilled to catch a snowball as a carrot. Her movements are athletic and acrobatic: She seems to simply enjoy leaping. She radiates pure joy when she shags anything thrown for her. I thought of how each of my dogs approaches a problem differently and the success of each technique. With the new calendar year beginning, I’ve been reflecting and planning. I also begin a new job this week. A lot of new things will be tossed my way. Linus has shown me that it is exciting to be goal-oriented, but to be successful, one needs to slow down a bit. And, sometimes one needs a second chance. Charlie pointed out that it’s o.k. to ask for help after giving the task a good try. As for Lucy, she reminds me to enjoy the leaping. Fayston, Vermont. Barking woke me up. Linus and Charlie were sounding the alarm downstairs, loudly. I looked at my bedside clock: 11:30. Probably a mouse or maybe a raccoon on the deck. I’m not going downstairs. Charlie spooks easily and Linus barks at the t.v. The visitor will move on, then the dogs will quiet, I told myself as I pulled the pillow over my ears. The barking became even more frenzied, joined by a third voice. A low, deep, measured bark under the alarm bells. Lucy. 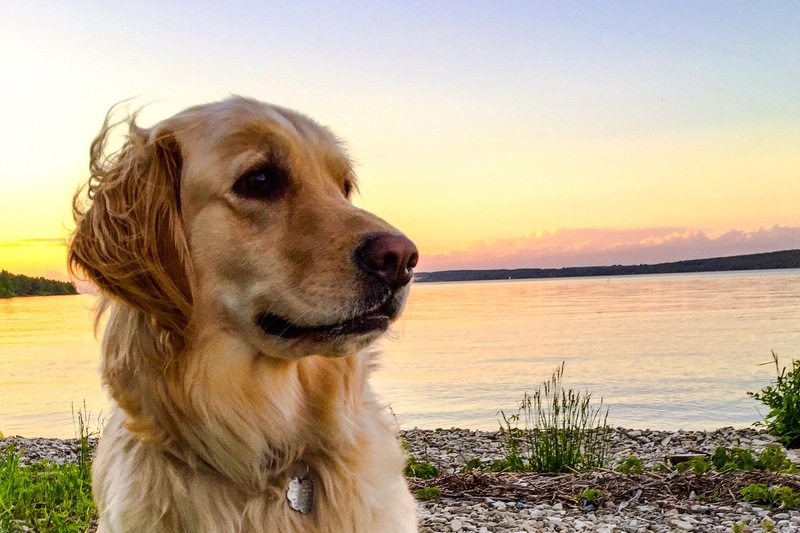 Golden retriever who’s never met a stranger Lucy. Hers was not an alarm, but a call for back-up. I made my way in the dark, down the stairs as fast as my arthritic joints would allow, switched on the outside light, and shrieked with surprise. I was standing a few feet away from A BEAR. We looked at each other through the window, the bear blinking at me in the sudden light. I took in its beautiful, thick, glossy coat and healthy, bright eyes. It was full-grown but young. Probably the same one who left prints on the driveway recently. A leaf was dangling from its mouth like salad interrupted. I wanted to reach through the glass to touch its head and brush away the food from its face. “What is it?” my husband finally called down from upstairs. “A bear,” I softly replied, not wanting it to run away just yet. Footsteps down the bedroom stairs broke the spell. The bear plodded around our emerging herb garden and ran into the trees at the back of our yard. (The dogs are not as polite – they run straight through the garden.) We could still see the bear in the shadows cast by the outside light. My husband returned to bed. I waited a long while before I went on the deck to close the gate. I brought inside the Brussel sprouts awaiting transplant. One of the plants had definitely been nibbled, but the others were untouched. I guess bears don’t like Brussel sprouts. Ed. note: Our house borders on state land. When we bought the house about six years ago, the sellers told us we’d have a moose and bears. We were not concerned as we were coming from New Jersey, where the bears are big, sometimes aggressive, and love throwing pool parties. Since we moved in, I’ve seen a bear on the road a few times, but not close to the house. In the yard, I’ve seen an ermine, an eight-point buck, and all sorts of rodents and birds. Plus a variety of reptiles and amphibians. Linus met a porcupine once, but that’s another story. Where the driveway meets the road, I’ve seen a family of fishers, a doe and twin fawns, turkeys, and a coyote. Still waiting to see a moose. On a walk a few days after the visit, I smiled as I followed familiar bear tracks down the middle of the road. The footprints made wilderness-styled street markings drawn in the dirt, a message left by my neighbor.